Which of the following venues would be your favorite location to host The Convention in the future? See locations and vote below. In January, the Treasury Department and the Internal Revenue Service issued final regulations regarding the new 20 percent deduction on qualified business income. As Americans begin preparations for the 2018 tax filing season, real estate professionals have been uncertain about the true impact of the 2017 Tax Cuts and Jobs Act on their respective businesses. The ruling from Treasury and the IRS, however, signaled a significant victory for the real estate industry and for many of the National Association of Realtors®’ 1.3 million members. Michigan Realtors® would like to thank all of the local associations who made the final push for RPAC investors at the end of 2018. With last year's state RPAC goal of $1,100,000, Realtor® members not only met, but exceeded that figure with a record-breaking total of over $1,112,614! Additionally, 23 local associations met and/or exceeded their local RPAC goal, and a grand total of 333 RPAC Major Investors participated. Local associations were honored last week at the Annual RPAC Appreciation Lunch during Achieve, held at the Amway Grand Plaza Hotel in Grand Rapids. Looking for Professional Standards or Grievance Committee Training? The Michigan Realtors® 2019 Professional Standards Workshops are scheduled to take place Thursday, February 14th in Saginaw and Friday, February 15th in Livonia. Pre-Registration at the rate of $20 closes on Friday, February 8th @ 5:00 pm. On-site registration will be available based on availability for $30. Lunch is included. Visit mirealtors.com for more information and to register. The temperature was negative, but the experience was positive for those in attendance at Achieve. The annual leadership conference took place in Grand Rapids, January 31 – February 1. Attendees worked together to develop new techniques and best practices as they embark on a new year of leadership. For those who were able to join us, please remember to complete the session surveys through the online agenda. For a complete recap of Achieve, read the March President’s Report in Michigan Realtor® Magazine. 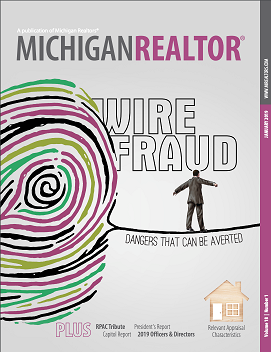 Did you know that Michigan Realtor® Magazine, which is published six times a year, is also available online in PDF format? Did you also know, you now have the ability to decide if you would like to receive a printed copy or access the online version? Unless you have previously contacted us to change it, your preference is automatically set to receive a printed copy. If you wish to continue to receive the printed version, no further steps are necessary. However, if you opt to receive the online version only, please follow the instructions below and you will be emailed when the copy has been posted to mirealtors.com. To change your preference, please visit the Michigan Realtors® Web Portal, login to your account, and click on Update Your Member Profile (under the tile in the upper left corner). Under Sections, click on Michigan Realtor® Magazine Delivery Preference, make your selection and save. Please note, based on when we pull mailing lists, your preference may not take effect until the following issue. While you are logged in, you will see there is additional information you can verify and make changes to as well, which are basic contact information fields. Feel free to review and update this information while you are there as this helps us to ensure our records (as well as local and national) are up-to-date with your most current information. Don’t Miss Out! Earn Your CE Early. Are you ready to tackle your real estate continuing education requirements? Great! Your first step is to determine what type of course will best fit your professional development goals. How do you prefer your classroom experience? Do you prefer a live classroom event with networking opportunities or perhaps you prefer online learning? Find the perfect type of continuing education class by using the CE Marketplace Calendar. I represented the buyer in a purchase of a house that closed this past summer. The buyer discovered some issues with water in the basement that the seller did not disclose. My buyer wants to take the seller to arbitration, but both parties left the section in the purchase agreement on arbitration blank. Can the buyer require the seller to arbitrate this dispute? Many Michigan purchase agreement forms require the parties to indicate that they agree to arbitrate by initialing the arbitration provision. Assuming that this is the case and the parties did not both initial the arbitration provision, there would be no contractual agreement to arbitrate. If the parties did not arrange to arbitrate in the purchase agreement form, the buyer will have to take the seller to court (unless the seller now agrees to arbitrate). Visit Law.Mirealtors.com for full access to our legal library, Q&A and video transcripts. On Wednesday, April 24th the Michigan Realtors® Broker Summit brings together elite brokers and Realtors® from around the state to address current real estate and market trends that impact their bottom-line. 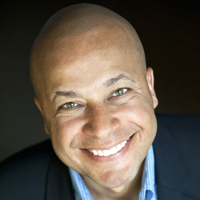 We are excited to announce that Terry Watson will be the opening keynote speaker for the Summit. Terry is an internationally acclaimed Consumer Behavior Expert who helps businesses and organizations discover how to design a Customer Experience that creates raving fans and obscene profits! The Michigan Realtors® is a recognized state leader in the placemaking movement. Lighter, Quicker, Cheaper (LQC) placemaking projects are small, inexpensive, and incremental community projects. These smaller types of placemaking activities can often help to improve a neighborhood and make it a better place to live, work and play. In 2018, $48,000 in micro-grants were awarded to 19 applicants. Visit the LQC web page to see recently completed projects, check out the interactive map and learn more about the micro grant program. According to the National Association of Realtors®, a new spam is going around the Realtor® community. NAR is not asking for credentials from anyone. The email starts with “Signature requested by”. Please ignore these requests. The Broker Summit is widely attended by big brokers and office mangers with over 190 in attendance. This event organizes Brokers who are connected to some of Michigan’s largest real estate franchises and managing brokers/office managers. Education is focused on industry and market trends. 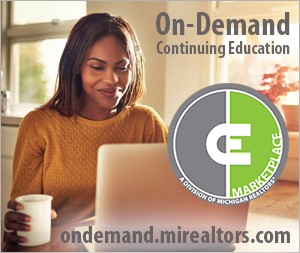 Michigan Realtors® is proud to provide assistance towards the higher education of burgeoning real estate professionals. Ensuring the success of our future members is one of our top priorities. The Michigan Realtors® Scholarship Trust provides scholarships to full-time undergraduate and graduate students who are taking classes that will lead them to a real estate career. For Michigan Realtors®, The Convention is the largest gathering of real estate professionals, with over 1,200 in attendance. Over 80 companies participate in the industry tradeshow which showcases many products and services involved in the day-to-day business of real estate. Michigan Realtors® are pleased to offer regional education programs in 2019. Each day of education will include two hours of CE Marketplace certified Within the Law legal education presented by members of the Michigan Realtors® and McClelland and Anderson legal teams and four hours of CE Marketplace certified elective education. As the premiere leadership event of the Michigan Realtors®, Achieve provides leaders of every level with the tools needed to be the change they want to see in their local associations, offices, and communities. The two-day conference gathers over 200 highly involved Association leaders and public policy advocates. Wish to sponsor or be an exhibitor at any of our Michigan Realtors® events? Please contact Jenn Morden today!